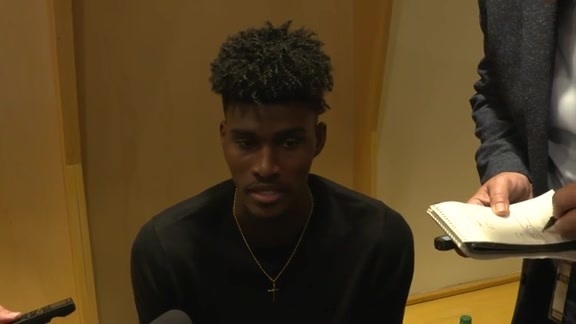 ORLANDO – Still a couple of weeks shy of his 21st birthday, forward Jonathan Isaac has a game that is very much in a similar place as that of his Orlando Magic. Heaps of athleticism combined with towering length and flashes of promising brilliance are some of the ways to best describe the 6-foot-11, 225-pound Isaac. Also, there is plenty of rawness and many questions – both with the young forward and the rebuilding Magic. Much of the Magic’s future success is riding on the growth and development of Isaac this season and in years to come. Orlando wisely brought him along slowly as a rookie, helping him through injuries and struggles while hoping to ensure that his future remains bright. Now stronger and more confident following a summer of tireless work, Isaac is hopeful that he can show off some of the skills that could make him a cornerstone piece of the Magic franchise. Already an elite defender and a developing offensive threat, Isaac will likely be the Magic’s starter at small forward when training camp opens later this month. How much of a leap he can make this season might go a long way in determining the strides that Orlando can make in the Eastern Conference standings. The Magic will hold Media Day at the Amway Center on Sept. 24 and open training camp a day later in Orlando. The team begins the preseason in Philadelphia on Oct. 1 and plays Brazilian powerhouse Flamengo on Oct. 5 at the Amway Center. For a third straight season, the Magic will open the regular season at home against the rival Miami Heat – this time on Oct. 17 ay 7 p.m. Season tickets and single-game tickets are on sale and can be purchased by logging onto OrlandoMagic.com or calling 407-89-MAGIC. PLAYERS: Jonathan Isaac (6-11, 225, 1 NBA season); Terrence Ross (6-7, 206, 6 NBA seasons); Wes Iwundu (6-7, 195, 1 NBA season); Melvin Frazier Jr. (6-6, 198, NBA rookie). PROJECTED STARTER: Isaac (2017-18 stats: 27 games, 5.4 ppg., 3.7 rpg., 1.1 bpg., 37.9 FG percent, 34.8 3FG percent, 76 FT percent). PROJECTED DEPTH: Ross (2017-18 stats: 24 games, 8.7 ppg., 3.0 rpg., 1.6 apg., 1.1 spg., 39.8 FG percent, 32.3 3FG percent, 75 FT percent); Iwundu (2017-18 stats: 62 games, 3.7 ppg., 2.2 rpg., 0.5 spg., 42.7 FG percent, 19.6 3FG percent, 72.3 FT percent); Frazier Jr. (2017-18 stats at Tulane University: 30 games, 15.9 ppg., 5.6 rpg., 2.9 apg., 2.1 spg., 55.6 FG percent, 38.5 3FG percent, 71.2 FT percent. STRENGTHS: The Magic should have plenty of athleticism and depth at this all-important wing position. In addition to featuring the rangy Isaac and backing him up with Ross, Iwundu and Frazier Jr., Gordon and Fournier can play at the small forward position at times. In Isaac, Iwundu and Frazier Jr., the Magic have three players who specialize in defense and have the length and strength to cover any wing player in the NBA. Isaac showed off his potential as a possible All-Defensive Team player in the NBA Summer League by smothering several scorers with his long arms, lateral quickness and explosiveness off the floor when coming from the weak side. 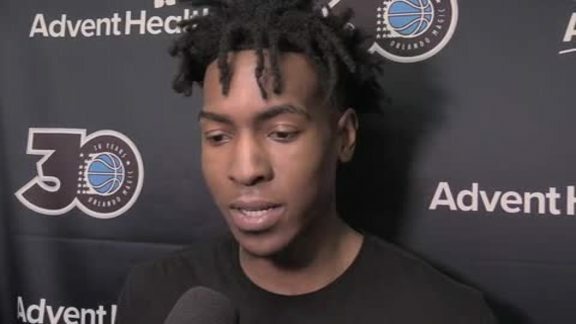 Orlando’s defensive metrics were strong last season when Iwundu was on the floor, but he and Frazier Jr. will have to work to carve out roles at a position that is especially deep for the Magic. WEAKNESSES: Orlando wants to play Isaac at small forward alongside Gordon and Nikola Vucevic or Mohamed Bamba, but there are legitimate concerns about whether or not the lanky forward can make enough shots from the perimeter to keep defenses honest. Isaac struggled with his jumper much of his rookie season, but constant work throughout the summer with the Magic’s new coaching staff has helped him re-work his form. Ross is hoping to have a big bounce-back season after missing most of last year with a knee injury, but he’ll need to shoot the ball much better than he did in 2017-18. Iwundu and Frazier aren’t known for their shooting and they will have to prove that they can consistently knock down shots in order to get minutes. ANALYSIS: Much of the Magic’s future is tied to the development of Isaac. Orlando took things exceptionally slow with him as a rookie because it wanted to ensure his health and his habits were solid going forward. After showing encouraging flashes as a rookie, Isaac revealed himself as often the best player on the floor for long stretches of the NBA Summer League. Isaac’s length, agility and smarts give him the potential to be an elite defender right away. The only questions come on the offensive end where foes will dare Isaac to make shots from deep. However, if he can simply be the best defender on the floor, rebound with aggression and take advantage of offensive opportunities presented by boundless energy, Isaac will be a stellar contributor in his second NBA season. Ross, a participant in workouts at the Amway Center much of the summer, will split time at both the shooting guard and small forward positions, as will Fournier. Regardless of where he plays, Ross must play with more confidence and conviction than he did last season. A starter early last season, Ross struggled badly when he was a fifth option on the team and often grew passive and unsure of himself. He will likely be used as a reserve this season, and Orlando will greatly need his ability to score points in bunches while with the second unit. Whether Ross can be consistent and make shots – questions that have dogged him throughout his career – could determine his long-term future with the franchise. 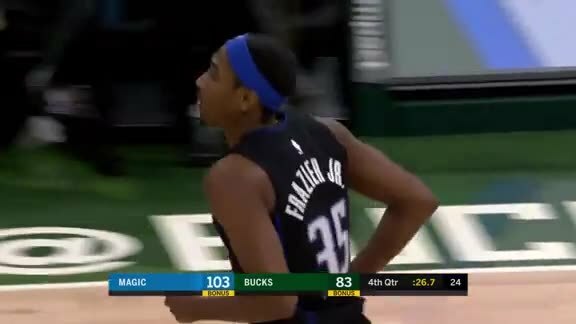 Iwundu and Frazier Jr. give the Magic two lengthy and fearless reserves who specialize in defense. Again, their chances to play will come down to their ability to make shots and contribute offensively.